Leading Wholesale Distributor of precision locknuts from Mumbai. We feel proud to introduce ourselves as the leading names of supreme grade Precision Locknuts. Provided locknuts are used for providing locking actions to resists loosening under vibrations and torque. 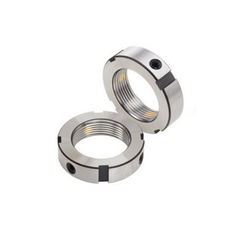 These locknuts are manufactured using high-grade metal alloys under the guidance of skilled professionals in tandem with industrial standards. Also, these products are tested on defined quality parameters to ensure their flawless designs. Looking for Precision Locknuts ?